Clemens Friedell (1872-1963) was born in Louisiana but in 1875 returned with his family to Vienna where he studied music and completed his apprenticeship as silversmith. In 1892 Friedell returned with his family to San Antonio, Texas, were his family had bought a farm. Initially Friedell was unable to find a work as a silversmith and he arranged to live teaching music for almost a decade. In 1901 he obtained a job with the Gorham Company and moved to Providence where he worked as a chaser for the Art Nouveau style Martelé line. In 1907, a financial panic caused demand for luxury goods to collapse, and Gorham laid off many workers, Friedell among them. He returned to Texas and farming in 1908. 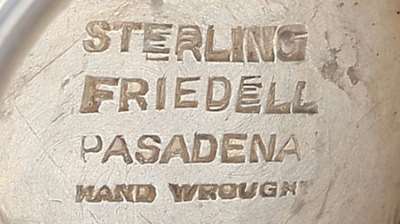 In 1910 Friedell moved to Los Angeles and began selling ashtrays and trinkets on consignment through a local department store. In 1911 he opened his own shop in Pasadena, where he found a ready clientele among local society figures and wealthy Easterners who flocked there each winter. Friedell's first major client was likely the philanthropist Phoebe Hearst (1842-1919), for whom he created a monumental loving cup in 1912. That the silversmith was capable of producing work in quantity and large scale is well demonstrated by the dining service he executed that year for LA brewer E R Maier. The service consisted of eighteen settings, numerous serving vessels, and a 20 inch tall centerpiece. 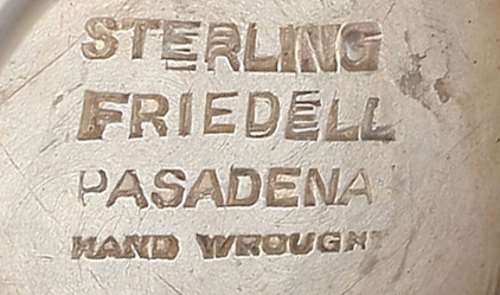 In Pasadena, Friedell benefited from a steady demand for presentation silver, particularly in the form of trophies, ordered by the many sporting clubs active in the region. Friedell created such trophies as well as shield shaped equestrian portraits mounted on wooden plaques, merging the Art Nouveau style of decoration and Arts and Crafts aesthetic that incorporated regional interests, such as California poppies, and a visibly hammered appearance. 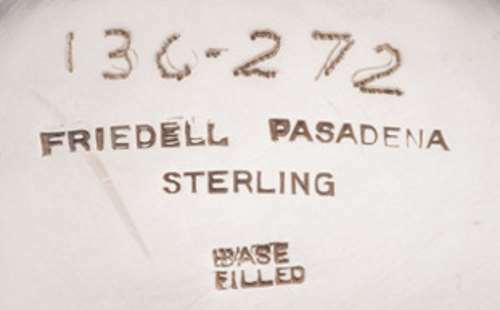 Friedell exerted a strict control over silver produced in his shop. His chief contribution was as a designer and chaser while his assistant did most of the raising of the heavy gauge sheets. 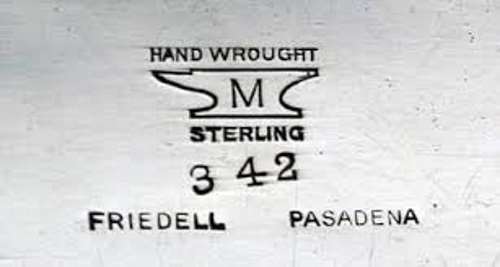 In 1916 Friedell rented a space at the Hotel Maryland, one of Pasadena's premium resorts. He was so successful that in 1921 he decided to retire, moving to Texas were he bought a ranch. In 1927 he returned to Pasadena and the silver business. The Great Depression had little effect on his success as enough wealthy remained in Pasadena to maintain a demand for his work, but from the 1930s his production involved much more ready-made goods for sale, including neo-classical and lobed style pieces, in addition to the Martelé work. The business prospered far into the modern era by adapting to changing times. Friedell maintained an active shop until sometime before his death in 1963, leaving no successor as he had trained none.